Yeah, I know, just what I need, another hobby! I purchased the book, Flour, Water, Salt, Yeast, by Ken Forkish. It's about making Artisan Bread and Pizza. There are recipes for every skill level and time restraint. Yesterday I made my first bread, a one day recipe called The Saturday 75% Whole Wheat Bread. It has much more whole wheat in it than most loaves labeled "whole wheat" at the grocery store. It was delicious! With the leftover dough I'm going to make The New Yorker pizza. Yum. Next I'm going to try a more complicated recipe: Pain de Campagne. It's a rustic country bread with a chewy and delicious crust. It improves with age for a couple of days after baking and can last nearly a week! 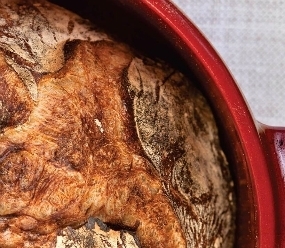 This recipes requires a "levain" or starter. You keep it in the refrigerator and "feed" it on a schedule. Then you use part of it with a recipe. This bread is even more flavorful than the one day bread. Now I just have to watch how much of this bread I eat. I'm going to be giving a lot of it away!